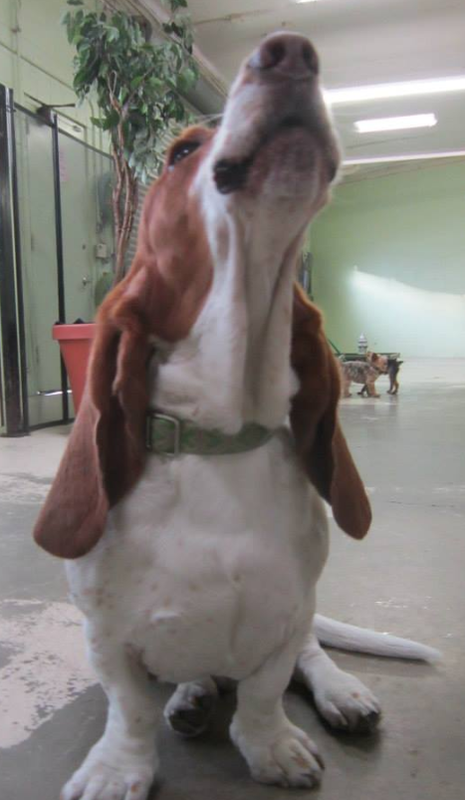 Baxter singing the blues at day care. Photo courtesy of Lisa Lynn. My hound Baxter has separation anxiety. I’ve tried everything. Bark Collars. Kongs. Treats hidden around the house. Hollistic calming chews. Training. Getting him tired in the morning. Day Care. Dog tranquilizers. Thousands of dollars in daycare, just to keep him out of the house. I’m now going a bit broke, and can no longer do this. So, I purchased a Dropcam to monitor Baxter hound during the day. Plus, we live seven minutes away my office, allowing me to come home during lunch hours to walk him and keep him company. But as I view him from the “puppy cam” (as we like to call it at work), I’ll observe. There’s some white noise. The TV is on. The fan is on. He calms down for long periods of time. He’ll sleep quietly until he wakes up randomly, realizing once again – he’s alone. So, he’ll jump off the sofa and head to the window. Then he’ll sit by the kitchen door, waiting for me to come back. In between, he’ll lift his head and howl. His howl is a sad, mournful moan. It bugged my former next door neighbor, who was more inclined to get pissed off than try to understand the situation. Which made him worse. My new neighbor loves him and says he just sounds so sad. It’s only during the day. He’s not a barker. He doesn’t bark at anything that passes by our door or window, although if someone is in the hall, he will grumble and maintain a low, guttural growl that only I can hear. Nothing more. He only howls. Like a lonely hound. He howls the first half hour of daycare with dozens of dogs all around him. He howls if I have friends dogs over and we leave for a moment to do something. He won’t howl when there are humans around, or if I’m there. The hound’s devotion to me is limitless. He lives to be with me. I can no longer afford constant daycare. So he has to stay at home more often. He will stop and sleep on the sofa or by the door. He’ll play with the Kong or the rubber disc filled with chopped up doggie treats – but he’ll save most of that playing for when I get home. He’ll listen to a noise that’s not the television, get up, go to the door, and the settle down until I see his head turn up and his muzzle/mouth turn into an “O”. And then I come home and he squeals with delight. He’s a lonely hound with an owner who has to leave him to earn a living. Who’s trying to build a business on the side so she won’t have to leave so much. Although today is a challenging one. I have so much work to do and concerned my business is not something that will allow me to exist as an independent earner. But I see my poor ginger hound and hope my efforts will pay off somehow. He’s a quiet hound when it counts – at night and most of the day. He’s actually quieter than the dogs in the building next door, who bark and yelp at mailmen and UPS drivers. He’s a lonely hound who makes noise intermittently, but compared to the constant terrier and Chihuahua screechers all around the block, he gets the brunt of it all. A hounds life isn’t easy. So, The Baxter boy has to stay home. I wish I could do the same. Categories: Wednesday Coming Down | Tags: Dogs | Permalink.